This Salomon womens trail shoes review is a result of cooperation with SoleLabz.com, where James and his team review some of the best hiking boots and shoes for both male and female hikers. Full disclosure: SoleLabz supplied the Trail Score shoes, while I supplied the feet and the trail. 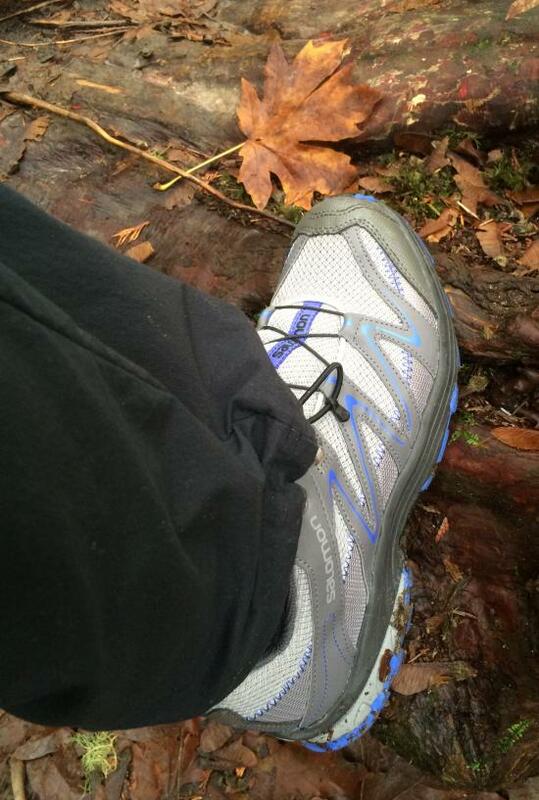 James is sharing the manufacturer's information, and I am sharing my experiences in these trail shoes. There is no affiliate relationship between us. Sometimes the word "trail" is used to refer to running shoes used by trail runners, as in "trail running shoes". Here, it's used to describe hiking shoes, used on certain trails in place of hiking boots. Hiking shoes, in other words, are the focus of this Salomon womens trail shoes review. Salomon is a true representative of companies that started out manufacturing one product and ended up successful at something completely different. They started out with saw blades and steel ski edges, but got famous for giving us some of the best hiking shoes on the market. Experience accumulated since 1947 is constantly poured into new and improved models, one of which is the aforementioned Trail Score. First of all, Salomon tells us these shoes are highly cushioned and very light weight, trying to assure us they'll more than satisfy in the comfort department. The upper is made of mesh and synthetic, giving it optimal breathability and drying time. The rubber toecaps offer extra protection. The lace closure is adjustable and features eyelets that are friction-free. The lace pocket will provide a very secure fit and storage. The footbed is made of foam and provides a lot of cushioning. Midsole features a dual-density build and adds on the overall performance in the field of shock absorption. Counter grip, non-marking, rubber outsole gives great traction, according to the manufacturer. Will the color combination please me, or make me queasy? Knowing that I was going to be writing a Salomon womens trail shoes review, I was extra diligent about asking these questions. My first impression centered on the lack of conventional laces. I'm not married to the idea of traditional two-handed shoe laces, but they make for quick "on and offs" at a rest stop. This lacing system looked sort of flimsy to me, but then I "got" the idea: they wouldn't come unlaced at inconvenient times. But how tight would they be? I don't like a lot of pressure over my toes and arches. And how in the world would you ever replace a broken or snapped section of lacing? Next I flipped the shoes to look at the soles. The word "contragrip" is right there, in bright red. There certainly looks like enough tread to handle dry trails, but what about wet roots and rocks? Only the trail will tell! Ask yourself: Will these soles stand up to the type of trails you like? When I eased my right foot into the shoe, I was immediately impressed with how much wiggle room my toes had. 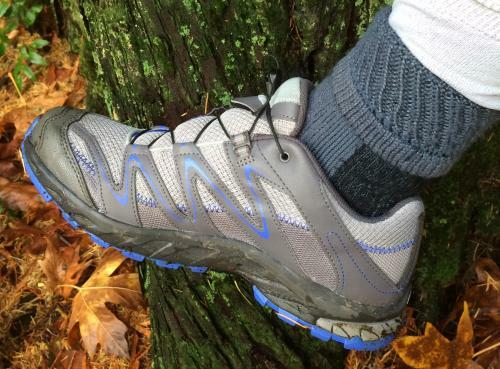 I like to wear 2 pairs of socks, thin liners and thicker socks over those, no matter which season or terrain I hike in (here's why). There was lots of room for those socks AND my wide foot in the shoe. Green light to put the other one on and hit the trail. Two pairs of socks, and plenty of room in these trail shoes! I have a thing about outrageous colors on the trail. Good news: the color combination was not an abomination. 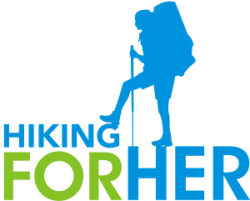 Have you seen some of the color combos marketed to women hikers? It was a relief not to have to report any shade of pink paired with neon orange or purple in this Salomon womens trail shoes review. "Gray and blue are colors found in nature, and therefore belong on a woman's trail shoe." Pretty, aren't they? But are they functional? Lots of toe room, a cushy landing for my arches, and plenty of sole to cushion each foot fall. However, the lacing system was a bit fiddly for me. Pushing the black plastic tab to tighten the laces was harder than it looked, due to my sore thumbs (a small gift from Mother Nature for us elder hikers). If your hands are pain free, you'll have no trouble at all getting the hang of this lacing system. I loved how easy it was to get the right amounts of pressure in the right places, without having to tug and pull on thick shoelaces as I do in my hiking boots. It was a surprise to discover the lacing "pocket", where you tuck away what you don't need with the help of velcro. It worked well to prevent trail debris from snagging my feet. As lovely as it is to take a new pair of trail shoes out of the box and get them laced properly, it's even lovelier to take them for a spin. 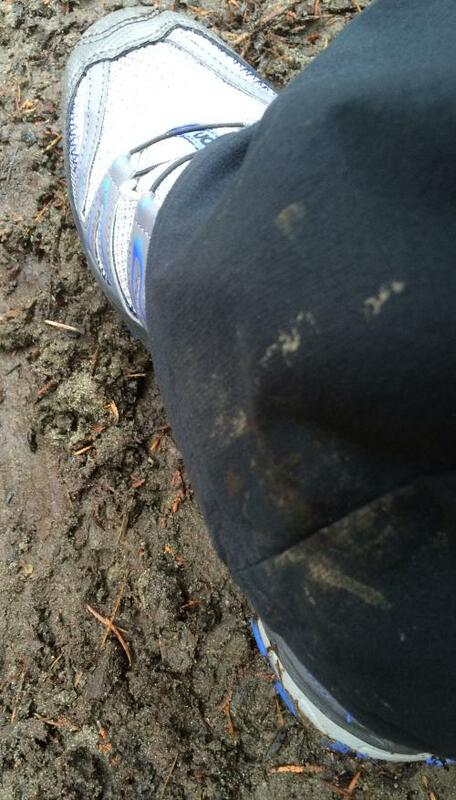 Luckily, it rained the first few times I wore the shoes, so there was plenty of muck and wet rocks to stomp on. The roomy toe box provided enough space for my toes to adjust and spread the load of my backpack. My feet stayed reasonably dry, but I wouldn't recommend standing in water for any period of time. After each hike, the shoes were dry and ready to go again within 12 hours. If you are not a fan of wearing two pairs of socks, you might want to try a half size down from your usual size. These are roomy shoes, which I am deeply grateful for. But if your feet are narrow, you might find a bit too much room in the toe box. Nothing 2 pairs of socks can't cure, but be forewarned. The tread definitely fills up with trail gunk after a few miles, as pictured. I recommend brushing off the soles after each hike before the gunk hardens. You don't want to lose any traction on slippery surfaces, right? It's hard for me to let go of the notion that I won't be wearing a pair of heavy, solid hiking boots on every trail. I've been at this hiking thing for coming up on five decades, and for most of those decades, hikers either wore big heavy boots or stayed home. Today, we have so many options for trail footwear, and these trail shoes are a great way to enjoy fast, light hiking. I couldn't believe how weightless these hiking shoes felt on my feet. But if you're going to carry a heavy pack, or concentrate on rugged terrain with a lot of rocks, roots and mud, these shoes aren't going to protect your feet and give you solid footing the way boots will. 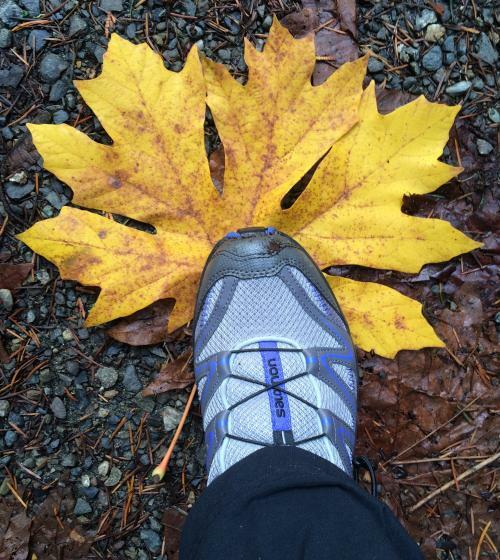 Match your footwear to your hiking trip, or risk sore toes, aching arches, or worse. These Salomon trail shoes deserve a close look next time you're in the market for a new pair of hiking footwear. surprisingly grippy on slick surfaces as long as the incline isn't too severe. My final score comes in around a 9.5 out of 10. I hesitate to give a full 10 because I know that I'll struggle with the lacing system tab on the days when my hands ache. If that's a non-issue for you, consider it a 10! If 9.5 seems high for a Salomon womens trail shoes review, remember that I have nothing to gain (or lose) by spilling all on these shoes. If I didn't think they were worth the money, I'd tell you! I can testify to the long history of Salomon in the marketplace, because I owned a very satisfying pair of Salomon downhill skis in 1975. This company appears to still be doing everything right in terms of outdoor comfort. Long live Salomon! 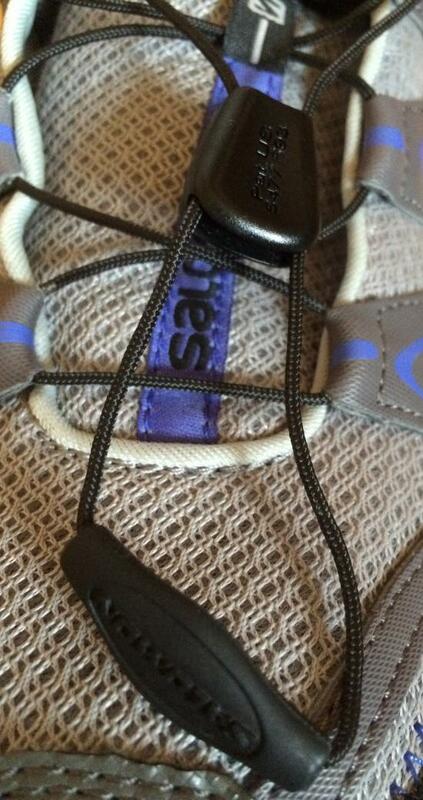 This Salomon womens trail shoes review was written several years ago. Hiking For Her has been wearing these shoes every spring, summer and fall since then, in Alaska and Canada, both on and off the trail. They have held up to a lot of punishment, and are still comfy and good looking. This company knows what it's doing with trail footwear! 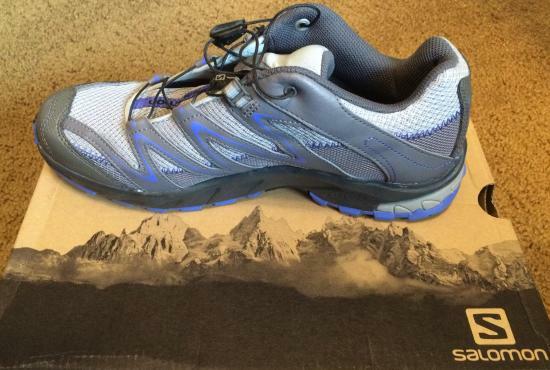 If you're interested in the HFH review of Salomon hiking boots, here you go!